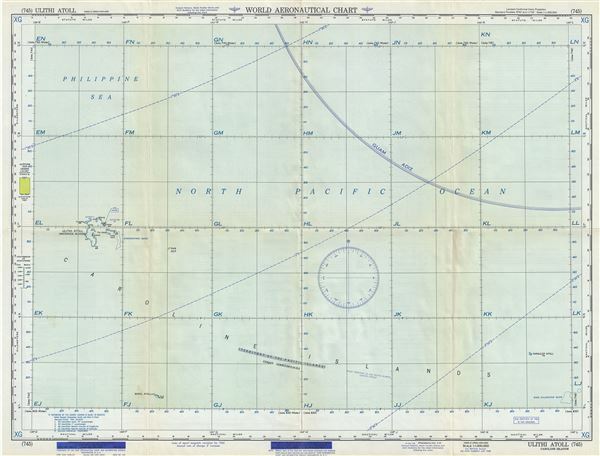 This is a scarce 1958 U.S. Air Force aeronautical chart or map of the Ulithi Atoll in the Caroline Islands of the western Pacific Ocean. It covers Ulithi Atoll, one of the largest in the world, including all its islands as well as the surrounding waters. The chart identifies Sorol Atoll, Faraulep Atoll, Earl Dalhousie Bank and the Trust Territory of the Pacific Islands (United States). During the end of the Second World War, the U.S. Navy was very active in this area and the Atoll was the largest and most active anchorage in the world between 1944 and 1945. Several sunken warships still lie at the bottom of the lagoon. Verso of this chart features legends and a world aeronautical chart index. This chart was published by the USAF Aeronautical Chart and Information Service, Washington 25, D.C., and was issued as chart no. 745. First issued in 1948, this is the third edition revised to Jan 1958.